If Finkelstein is right, political factors are restricting the fiscal options open to the UK, regardless of the economic justifications or consequences. Crudely, there are two broad visions of how the government can help the economy to recover. The coalition’s view is that reducing government spending now will reassure the markets that we have a credible plan to pay off our debts, and the smaller state will also encourage private sector activity, stimulating growth. An alternative view is that cutting government spending prevents growth, which not only means it will take longer to recover, but also risks scaring the markets about our ability to pay off our debts. Only more spending now, relying on more borrowing, can stimulate the growth that will allow Britain to turn the corner. Both strategies have plenty of supporters and opponents, including among those with prestigious economic credentials. To preclude either approach, just on the basis of its being too politically unworkable, would be an alarming way to tackle an economic crisis. Yet this is exactly what Finkelstein says has happened. The polling is tricky to untangle because the alternative plans can be described in such a variety of ways. However, the general picture suggests that the ‘borrow more to borrow less’ approach may not in fact be politically impossible. Lord Ashcroft’s recent poll found 60% support the government’s plan, and 40% an alternative. But that alternative approach is sold short in his poll. It’s described as slower cutting to reduce the pain, leaving out the argument that more spending could stimulate the economy and avoid worse problems induced by stagnation. The 40% figure is thus lower than a more balanced description would produce. A more useful guide is a question periodically included in YouGov’s polls for the Sunday Times. 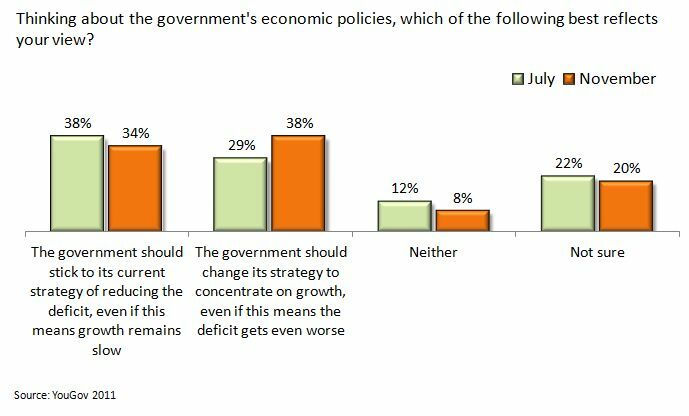 Since July they have asked whether the government should continue with its strategy of reducing the deficit, or whether it should change strategy to concentrate on growth. It’s a fair summary even if it doesn’t cover the full arguments. Yet this still doesn’t tell us whether the alternative is a politically viable strategy. Even if a ‘borrow more now’ plan had public support, it might not be treated kindly by the media or even the markets. And our electoral system requires more than piling up votes among heartland supporters. This distribution makes life harder for the ‘borrow more now’ strategy, but it certainly doesn’t mean that it’s politically impossible. As we’ve seen, the trend over the last few months has been for growing belief that the government is paying too little attention to growth, albeit without the polls fully testing whether there is appetite for more short-term borrowing to reduce long-term borrowing. This trend has developed with no prominent politician consistently arguing for this approach, and indeed with most declaring the necessity of the opposite. Ed Balls has at times suggested that there could be an alternative strategy along these lines, but without the rest of his party’s vocal and consistent backing. 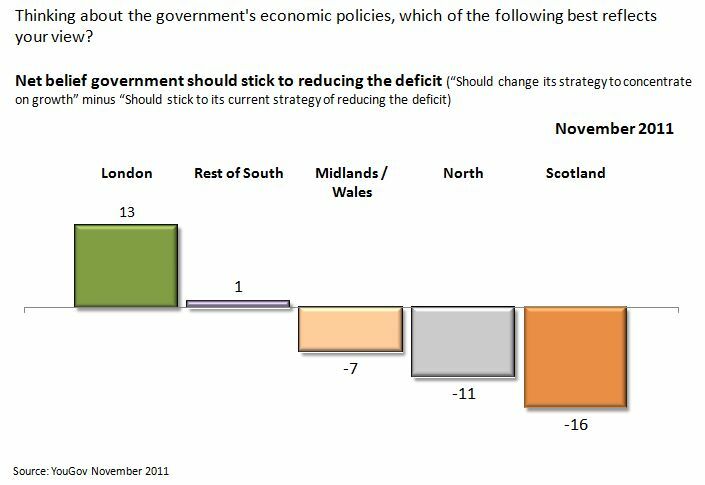 Yet even in this landscape, it’s striking that more now think the government should go for a strategy that lowers the short-term priority of deficit reduction. This hasn’t translated into changed political or media interpretations of the task ahead, and so for now that strategy may feel so outlandish as to be politically impossible. But it may not stay that way. 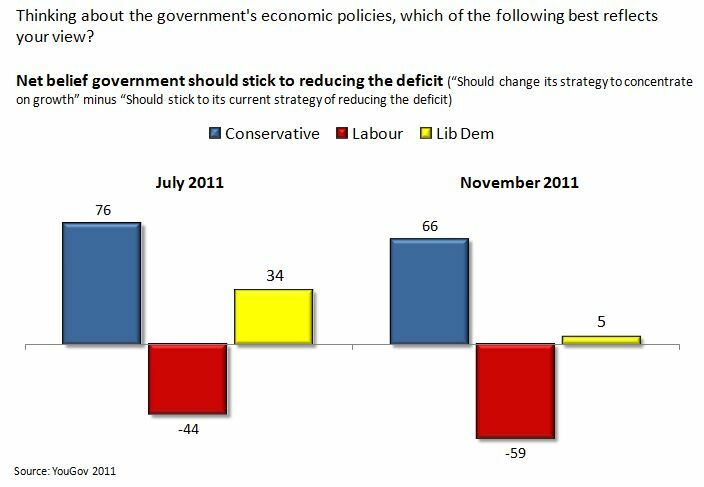 Finkelstein is probably right that Labour would be panned as deficit deniers if they came out clearly behind a policy of ‘borrow more to borrow less’. Yet, the mood of the country has shifted. If it continues to move, the economic options may prove to be wider than they seem. This entry was posted on Monday, December 5th, 2011 at 21:25	and is filed under Politics. You can follow any responses to this entry through the RSS 2.0 feed. Both comments and pings are currently closed.